Nearly one in four Multnomah County students miss more than 10% of school days. This leads to academic struggles and an increased risk of dropping out. Irregular attendance also signals greater challenges, including housing insecurity, and mental and physical health challenges. Since 2012, the All Hands Raised Partnership has had a focus on improving student attendance, especially for students of color and students in poverty. Beginning in the 2014-15 school year, six schools initiated a collective impact approach aimed at improving attendance. As a result of two years of focused work, five practices that lead to improved attendance were identified. Now, the All Hands Raised Partnership has a commitment to integrating attendance measures into all of work happening at school community sites, and especially at those focused on improving kindergarten transition and improving disproportionate discipline–and we are partnering with other attendance initiatives and programs in our community to spread practices that improve school culture, increase attendance and keep kids and families engaged. 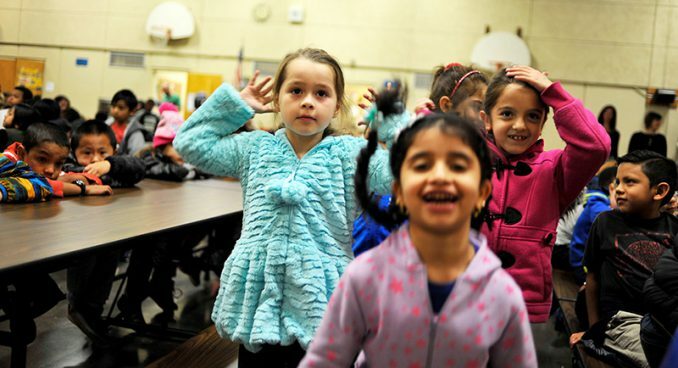 Read this story about the work to improve attendance at one partner school–Highland Elementary School in Gresham-Barlow. In 2014, All Hands Raised, Multnomah County SUN Service System and partner school districts launched a partnership with the Oregon Department of Human Services which placed six full-time self-sufficiency case managers into six targeted schools across the partner districts. The initial impacts were positive: 69% of students served through the DHS partnership showed improved attendance rates. The partnership has persisted and evolved, with the six case managers now serving students and families in eleven school communities–all of which bring a focus on attendance and engagement with our schools.